I have been off the ranch the last few days spending time in Cleveland. It was a lot of fun to get away for a couple of days and relax. I hung out with Dawn's family and friends and then yesterday they had a wedding shower for Dawn's family and friends. My mother and sister also came up for the shower. I guess Cleveland showers have the groom present...was not aware of that...but it was a lot of fun and my mother-in-law to be made an awesome center piece on the desert table. 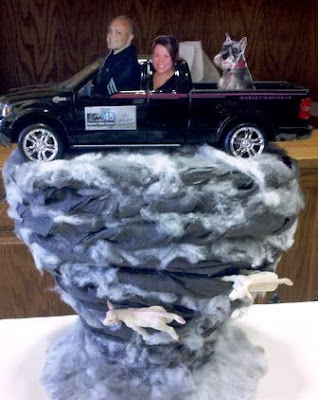 She made a tornado and put a truck on it with Dawn, Buckeye, and me... it was pretty funny and awesome. Huge thanks to everyone who came out... my mom said she may want me there for my side of the family as well so Dawn can relax a little more. Getting ready to come home this morning from Cleveland, I had to rearrange the gifts in the back seat of my truck. I was bringing home two other members of her family to Dayton, and with their luggage and such, there was no room. I should not have taken a shower beforehand. I broke a sweat about five minutes into the half an hour ordeal. I took everything out, raised the back seat and then made everything fit nice and snug... with a little room to spare. I did also turn on the A/C at the house for the first time this year... So far we have hit 88...the warmest day of the year so far. Monday is the unofficial start to summer as Memorial Day. We should hit a high of 90 both tomorrow and Tuesday before a few storms roll into the area. They should be scattered and will drop our temperatures into the mid 80's for the rest of the week with plenty of heat and humidity. Stay cool and have a good one! After what has happened in the Plains this week, I hope that people take the warnings very serious today in Ohio. We normally can have quick spin-ups of tornadoes, but today has the ingredients for tornadic storms unlike anything Ohio has seen this year. Based on the forecast from the Storm Prediction Center, the Southwestern part of Ohio is in the Moderate Risk for severe storms, which I believe is the first of the year. While strong winds and hail are a real threat, isolated tornadoes are possible as well. As a matter of fact, the Western part of Ohio is in the 10% chance of a tornado within 25 miles of a given point. Much of the rest of Ohio is in the 5% chance. This is a very serious matter. Even though we may not see the best chances for tornadic storms, the warnings should not be taken lightly. We had two tornadoes in the area two days ago and hopefully with the media's display of the deadly storms in the Plains people have thought serious about that they would do if the situation happened. A NOAA weather radio is a great idea. They are about $30 and extremely important in situations like this, where staying alert may be the factor between staying alive or not. This may come off as harsh, but please heed the warnings today. Stay safe and have a good one! What a beautiful day yesterday! Plenty of sunshine after a gloomy week and to top it all off we got the moped group together again. 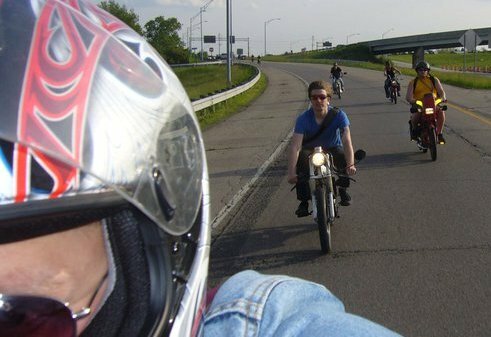 We ended up getting eleven people together for the picture for our website, DaytonAreaMopedRiders.com. It was quite a story though to get to the eleven people. Eight of us met up at my place around 6 PM and we started off by heading to Sonic down the street. Sonic is great for groups because almost each person paid with a card once they ordered right at the kiosk. Simple and fast. We took off from Sonic and the eight of us went to Oregon District Park. Two guys found our website and emailed us about getting involved and ride their stock mopeds with us... So we rode down to the park to meet them and pick them up for the ride. We rode around Fifth Third Field with the Dragons playing...lots of smiles and waves from the fans. As we were going around the ballpark people were trying to flag us down at one party and then a block later some guy with a bicycle with a motor rolls up next to me. He said that they wanted to start a moped gang and that his company was having a grill out and had free hot dogs... even though we just came from Sonic, we had to see what it was all about, so we followed him. We rolled into the Real Art Design Group's parking lot and there were about four people with video cameras and others with still cameras capturing our pit stop... good times. It turns out that none of them have mopeds yet, unless you count the motorized cruiser bike. He did take an old Sachs moped, gut it, rebuilt the frame and put a Briggs and Straton motor on it... no pedals... and barely an improvement on performance... heavy as a beast... but I admire the enthusiasm. We hung out with them for a little bit and gave them my contact information and told them as soon as they get mopeds, to hit us up. We did tell the guy with the bike to ride over with us to Deeds Park two blocks away, across the river. We figured we would throw in his bike for the website pictures, just for the fun of it. Wes's bike was not part of the picture because he tried pedaling his moped around to try to see if he could stir the pot with a park ranger... I think a few of the other guys did get a picture with all of the bikes when Wes finally came back. We then slowly split up... a few guys hung out downtown and the rest of us all went through University of Dayton and then rolled around Carillon Park where the Blues and Brews Festival was being held. I had to stop and throw off my helmet because a bee flew in my helmet and stung me in the ear... luckily no swelling, which never happens. The remaining seven got less than a mile from my place before two people busted their throttle cables... I guess they weren't ready to mash the throttle yet. After trying to get the bikes running with no decent results, I ran home to get my truck and picked the two of them up. It was a complete blast to get together and ride with everyone...and the weather could not have been better! I can't wait to do it again. Today's weather looks to be great again, a little warm, but I will take it! A chance for pop-up showers and storms starting tomorrow and lasting well into the workweek ahead... and highs will be in the low 80's most of the week. Enjoy and have a good one! After my last experience trying to head to a Reds game turning into a washout and the game getting postponed.... last night was a whole bucket of fun. I went with Dawn and two very close friends, KZ and Melissa. There was a very light mist by the end of the game, but not enough to get the rain coats out. We had fantastic seats, and guess who was sitting two rows behind us...one of my aunts. She was there with three of her friends and they started yelling at me and I thought they meant someone else, goodtimes. The four of us came home and watched the Bulls lose to the Heat...sad times. I actually worked before going to the game yesterday and finished putting together my allergy series and also my Where You Live story earlier in the week. Today, I have the day off and I am about ready to head outside to mow the grass then head out for a moped ride. More work tomorrow morning and then moped get-together later in the day and then Dawn's neighbor from Cleveland, Theresa is coming to visit for the weekend...so I got a fun filled next four days! The rain may come back from time to time today, but tomorrow should be fantastic!! The warm temperatures will return with highs around 80 starting Saturday and can't rule out the chance for isolated thunderstorms from Sunday and on into next week. Enjoy the next couple of days and have a good one! Well tonight was interesting... I ran home for dinner pretty quick with NO rain in the area... and as I pulled back into the parking lot of the station a Tornado Warning was issued for Miami and Shelby County. I was on-air for the warning for about an hour and a half until 8:45 PM because the warning was extended. There was a tornado spotted by Miami County EMA first, then by storm spotters, then also by law enforcement. The spotted funnels and possible tornadoes were very weak and a few reports were spinning up a little debris. We will have to wait until tomorrow to see what the National Weather Service has to say. Mad props to Malcom Maddox for helping with the cut-in and also Jeff Booth, who got ready came in on his anniversary...not to mention the production crew, producers, reporters, and photogs behind the scene, great work guys. The next couple of days still look like persistent showers. They will be on and off, but a rather wet, cold, dreary day. Temps will barely get into the 60's tomorrow and only the mid and upper 50's for Monday, Tuesday, and Wednesday...which is when we will finally start drying out. Temps will warm up for the end of the week with partly cloudy skies. Have a good one! I own a few bikes. I have a mountain bike that I left on the farm and my parents and siblings left out in the rain a few times which rusted and left it in horrible shape. I also have a cruiser that is ugly as sin, but a blast to ride casually and got me through college. After doing a couple stories on the local network of bike paths and local bike shops I had caught the biking bug. I am obviously fully infected with the moped disease, but there is something about the quiet, self-propelled commute through nature that bit me recently. After looking through Craigslist the last week or so, I finally found a bike worth jumping on. It is not a well known brand or have anything flashy...just a ten speed in excellent shape with new tires, grips, and detailing...not to mention 63cm, which was important for someone as tall as myself. Another thing that really caught my eye besides the shape, size, and care for the bike was the price... it was less than a tank of gas. I was called back today and picked it up... only thing was...was that the guy had to remove about ten of his other bikes so he could get to this bike... he obviously knew his stuff. I took it out for a short ride before work today, and can't wait to adjust a few things and take it for a ride along the river...maybe I will see you there! Today turned out beautiful for Mother's Day in Western Ohio...Happy Mother's Day Mom! Tomorrow looks to be much of the same, but a little warmer. Showers and storms will return later Monday night into early Tuesday morning... and with more sunshine, temperatures will continue to climb into the low 80's for Wednesday with humidity riding on it's back for the climb. More showers and storms for Thursday with a few lingering showers on Friday as temperatures fall back into the mid and upper 60's heading into next weekend. Enjoy the sunshine between the rain and have a good one! I worked on my moped brakes this morning. I have tried a lot of different things to try and help me stop better, but nothing worked. I think I may need to take the wheel hub to a machine shop and try to get it re-lined. The good news is that our decal logos for the DAM Riders, Dayton Area Moped Riders arrived. I put them out my headlights and a few of the other guys started using theirs as well. I like it a lot. Brandon thought the fist was like a mound of dirt...dam, and we liked the spark plug wrench, so I added that to the image as well. We are really starting to get more and more people involved and it is a great feeling to ride with a group...not that riding alone isn't fun. More showers and maybe even a few storms will remain around the area tonight and early tomorrow. The second half of Mother's Day looks to try out a little bit and turn partly cloudy. Monday looks great and then more rain for Tuesday and Thursday. There is a slight chance Wednesday, Friday, and Saturday, but it looks very isolated for now. Temps will get into the upper 70's if not 80 for the middle of the week and humidity will be creeping up as well. We hardly ever have spring in Ohio... skips right from winter to summer... oh well, I will take it...that and more sunshine. Have a good one! Well for the first time I blasted my moped around downtown Dayton. 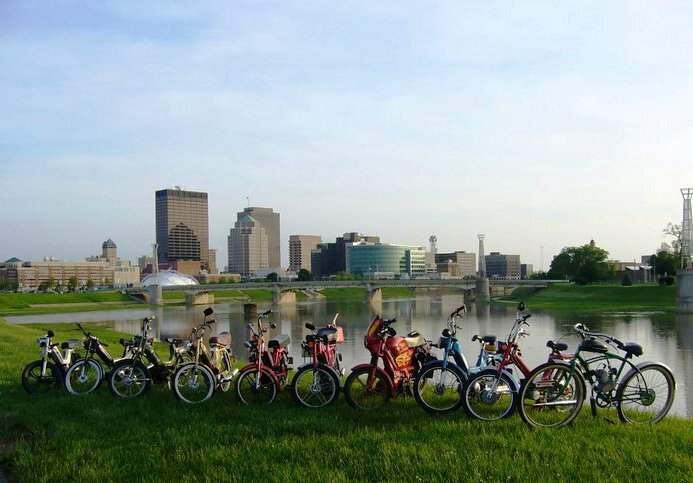 I have always rode around Dayton, but I felt that in order to really enjoy, the first time, it I needed others to help turn heads. Shawn, Wes, and I finished trying to work on Shawn's Tomos...pain in the rear, and we went out for an evening ride since it will likely be the only dry day between 12 other wet days. We rode up and down Oregon District and got shouts and fist pumps, and then rode around the Dragon's Game at Fifth Third Field. We stopped at Deeds Park for a quick photo...(love the skyline from that angle and time of day)... and then we proceeded back home through downtown. Shawn's moped was loosing bottom end, so I had to assist him by putting my hand on his back and pushing him up hills. I was even able to push him up the huge hill on Dorthy Lane... who ever told me to gear higher and get a different pipe!?!?! Haha. I still wish I was more in line for top speed, but I love my low end with my set-up. Wes and I got lost from Kettering to West Carrollton because we wanted to ride the back housing areas rather than the main streets... We got all turned around and then eventually got back onto Stroop. We also found a permanently fixed MPH radar gun next to a community park... by the time I saw it I wouldn't have time to get to full speed, but I still got 37 up a little hill. Two thumbs up! I got home and Dawn had finished packing(heading back to Cleveland Friday to get her wedding dress altered) and we watched The Office. No where near as funny now that Steve Carell has left. Well the rainy days have returned, only a shower or storm here or there the next week or so. There is a small chance every day, but there may be a day or two where someone else will see the rain, but you will remain dry. Monday looks to be the best chance for dry weather... isn't it weird how we now forecast the dry days..haha. We will start to warm up and by the middle of next week, we will see our first humid week of the year. Have a good one! The Dayton Area Moped Riders finally got decals. They look amazing on the headlights. We are actually meeting up later today for a ride together. It is gorgeous out. Had I blogged recently I probably would be outside, but I felt a need to jump on here a bit. I ran a lot of errands today, did a Where You Live shoot at Sycamore State Park(because it was SO nice out), got my hair cut, mailed some stuff out, mowed the grass, started laundry, and washed the dishes... Needless to say, I don't rest much on my "off" days. Tomorrow I am taking Buckeye to the groomer and I have a school talk in Springboro. The beautiful weather doesn't look to stick around too long. More rain is in the forecast for the next week or so. The best chances for rain will be later Friday, later Saturday... we look to dry out a little later on Mother's Day and mostly dry on Monday... before more rain Tuesday and Wednesday. Nothing looks to be super heavy or a washout... just lighter scattered showers and maybe a few storms. Honestly, despite a chance for rain almost all of the next 6 days, we should see about 70% of the time dry, and the 30% of rain will be on the light side...Which is fine with me, my shortcut to work has been flooded the last month and the detour is curvy and takes about twice as long. Anyway, enjoy the great weather and have a good one! Been super crazy busy the last few days. Work, Work, Reds Game, Work, Neil Young concert, Work.... I have not had any time to sit down hardly. Just wanted to pop on and drop a line. I am off the next two days, sorta. Looks like a few showers today, but much nicer for Thursday, before more rain arrives. Ugh, right?! Enjoy tomorrow and I will be back on shortly....Have a good one!